Skippack, PA (March 7, 2013) – Counting down to baby's arrival is such an exciting time. Choosing a car seat, crib and tiny clothes may top the list of things to ponder. But once the little bundle of joy arrives new moms quickly learn that they don't come with instructions! 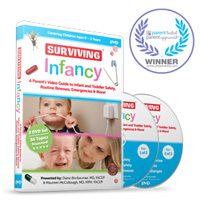 A strong dose of mom-sense is needed and that's when Surviving Infancy™ -- a video guide -- may be the best resource in the world. Emergency physicians Drs. Diane Birnbaumer and Maureen McCollough explain 36 must-know topics that can be played as streaming video on an iPad or laptop or on a DVD on the TV. The video clips of key information soothe parents any hour of the day or night as they "survive" the first three years of parenthood.